Watto: … I want to see your spaceship the moment the race is over. Qui-Gon: Patience, my blue friend. You’ll have your winnings before the suns set, and we’ll be far away from here. 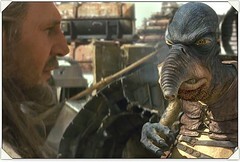 Watto: Not if your ship belongs to me, I think… I warn you, no funny business. Qui-Gon: You don’t think Anakin will win ?